Previously I posted about Bach Rescue Remedy to help your mood and anxiety when you’re in your physical pickle. While it’s definitely worth using, it’s a solution for in-the-moment feelings and crisis. So you may also choose to get educated about individual Bach flower essences to use one or a combination to address specific issues. Click that link to go to Dr. Bach’s site to read about each of the essences. Each of the 38 remedies is directed at a particular characteristic or emotional state and can stand alone or be mixed. Search Bach Flower Essences on Amazon here . When I used these remedies personally, I found them to be a huge help. Like an onion where you peel one layer to find another, I used Bach flower remedies to tackle very specific issues with my mood and thought patterns. When I felt better, I would move on to the next onion layer. If I felt negative thoughts returning, I would go back to the remedy for a couple more weeks. I cannot promise any of this will work for you, I just know that it did for me. They are 100% natural, homeopathic remedies and cause no interactions with other medications. 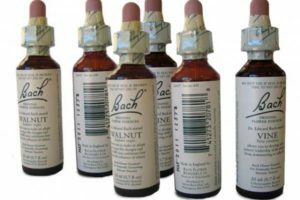 Search Bach Flower Essences on Amazon here .